Key Information Systems, Inc. (KeyInfo™) is a leading regional systems integrator with world-class compute, storage and networking solutions and professional services for the most advanced software-defined data centers. These competencies are tightly complimented by a full suite of data center capabilities, including private and hybrid cloud offerings, connectivity services, colocation facilities and managed services. KeyInfo’s converged infrastructure and software-defined data center solutions are backed by a complete range of professional services, including readiness assessments, deployment and integration, training, comprehensive project management, maintenance and financing. KeyInfo’s data center offerings, deployed on the most advanced technology solutions available, are hosted in carrier-grade environments and include offerings for 24/7 management and monitoring for on-premises and off-premises environments. KeyInfo™ holds platinum-level designations from its manufacturer partners and consistently achieves the highest levels of client satisfaction. Among numerous accolades, Inc. magazine rated KeyInfo™ as No. 42 among the Fastest Growing Privately Held Companies in the United States and the No. 1 Fastest Growing in Los Angeles. 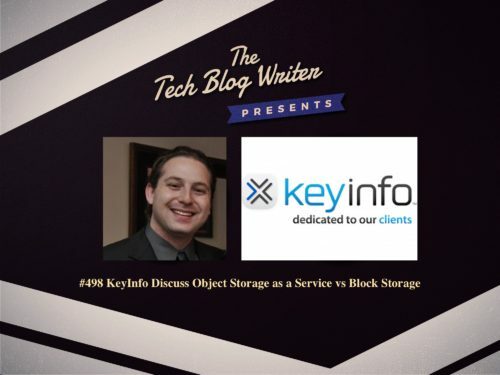 Clayton Weise is the director of cloud services for KeyInfo and discusses what trends he is seeing from his clients that are encouraging them to consider object storage, why it’s a popular choice over file or block storage, how it can address rapid data growth that can come with things like police bodycams, healthcare files, etc. as well as best practices when implementing an object storage strategy. I asked Clayton to take a break from managing and overseeing service provider environments including diverse teams of people, networking, servers, storage and services from dial-up to datacenter and have a chat with me on my podcast about KeyInfo. Remember to send me your questions by clicking on the link below.